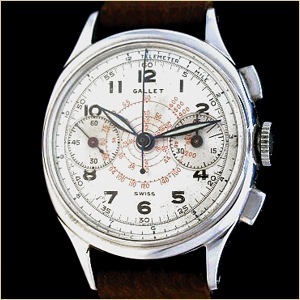 A true mid-sized wrist timer, the Commander was powered by the world's first and only oval chronograph mechanism. This uniquely shaped in-house manufactured Excelsior Park 42 movement allowed for a time recording wristwatch of smaller proportions for professional women or the man desiring a timepiece that fit easily under the cuff. 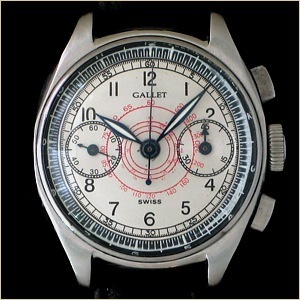 The Commander was also the first wrist chronograph capable of recording events lasting up to a full 45 minutes in duration. 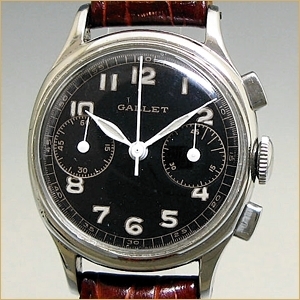 A Gallet Commander was worn by 2nd LT. James Richard Hoel, one of the escape tunnel diggers at Stalag Luft III, a German prisoner of war camp during WWII. The heroic efforts of these Allied soldiers were later portrayed in the 1963 movie, “The Great Escape”, starring Steve McQueen, James Garner, and Richard Attenborough. Serial numbers: 742002, 749001, 789685, 833666, etc.